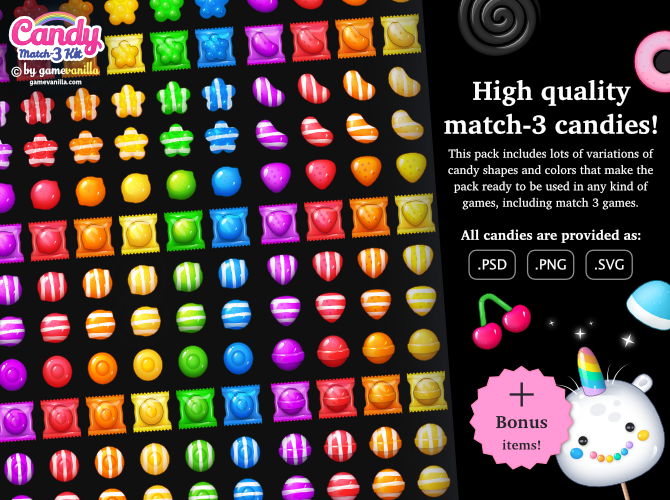 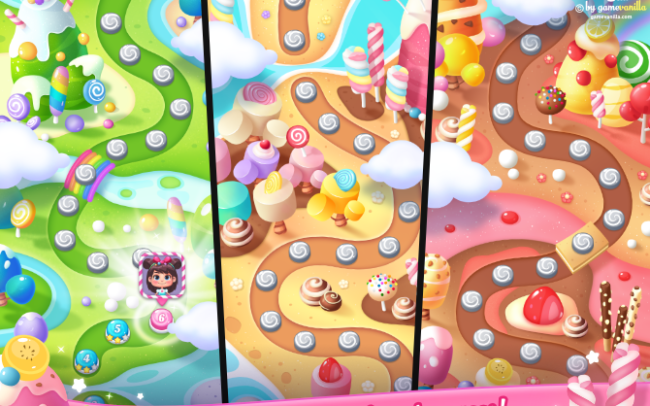 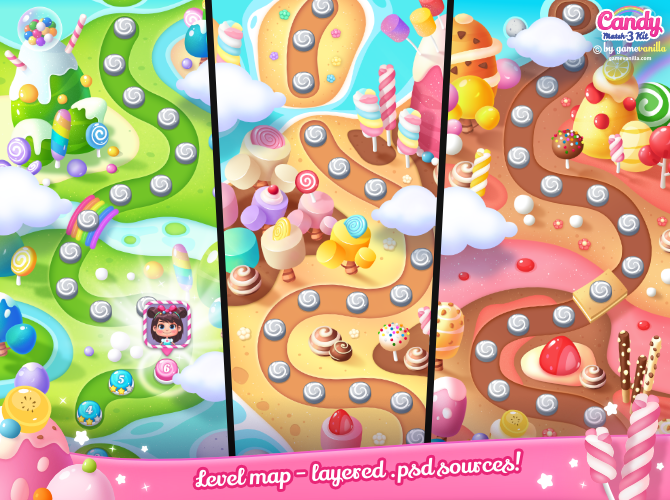 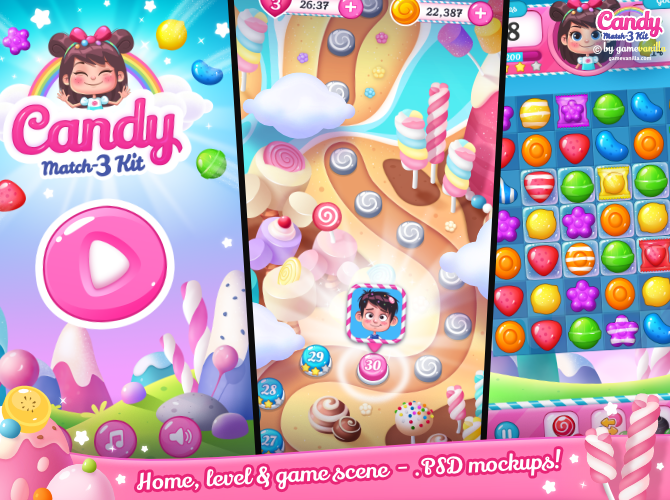 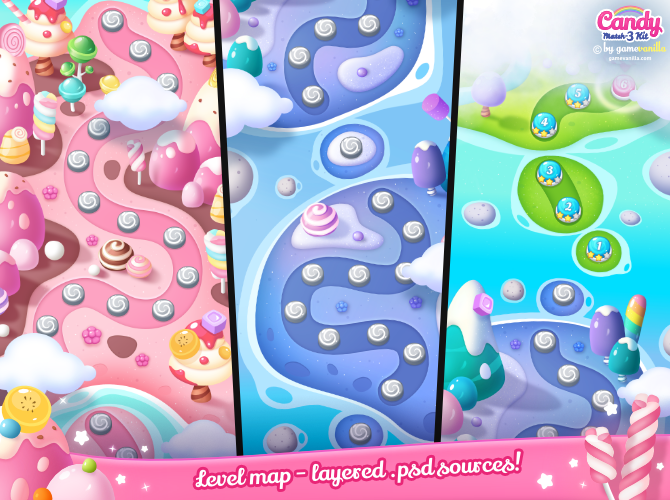 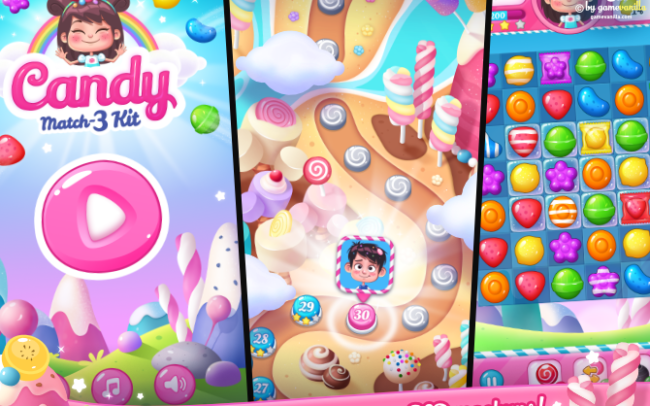 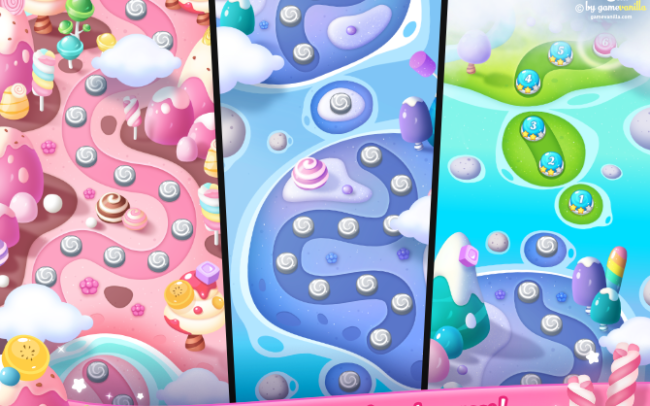 This pack includes 200+ high quality graphics used in the Candy Match 3 Kit asset. 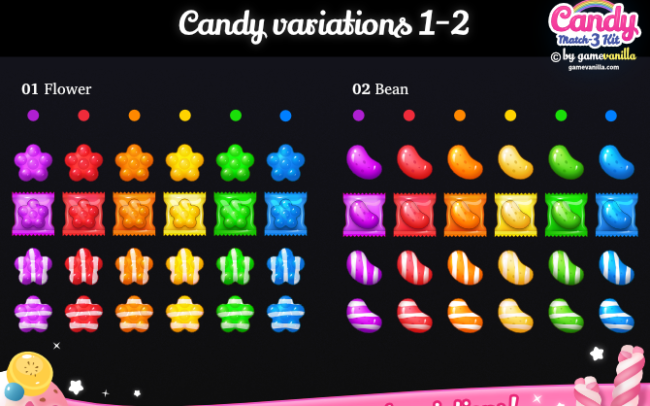 .PSD, PNG, SVG candies & icons (Scalable Vector Graphics, which are very useful if you need to re-export the sprites from Photoshop to have a bigger size). 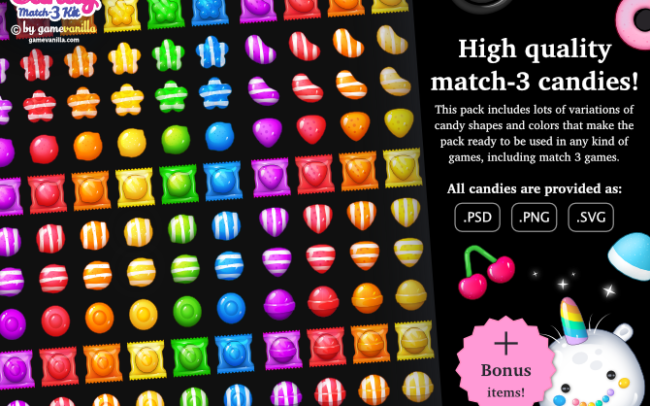 Lots of elements and icons that make the pack ready to be used in any kind of game, including puzzle games. 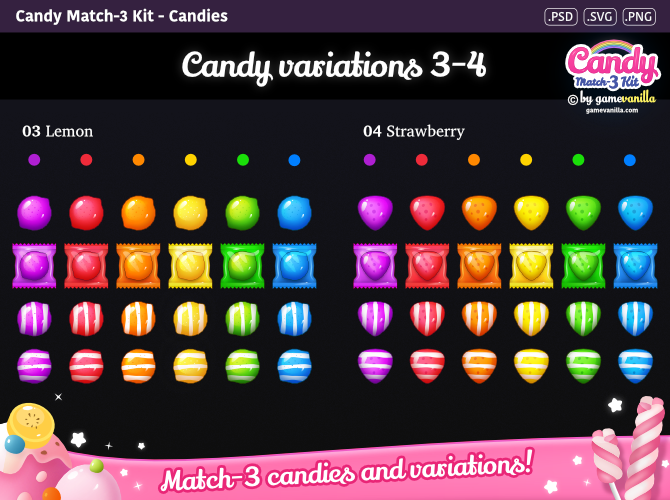 What are the licensing terms of the pack? 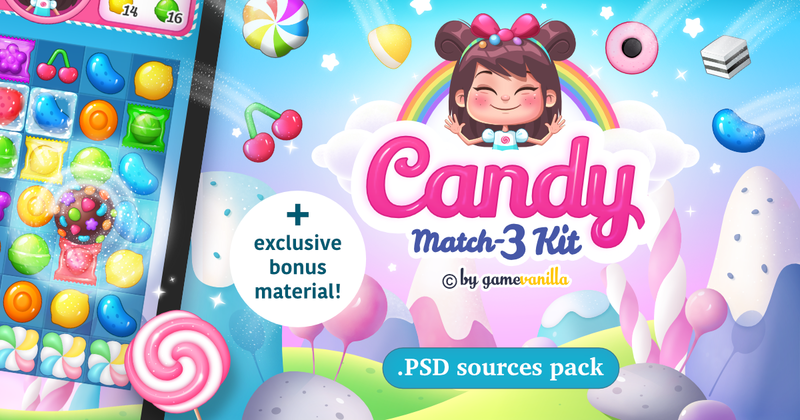 The copyright of the Candy Match 3 Kit .PSD Sources Pack and all of its contents (including both the art and the source code) belongs to gamevanilla ©. 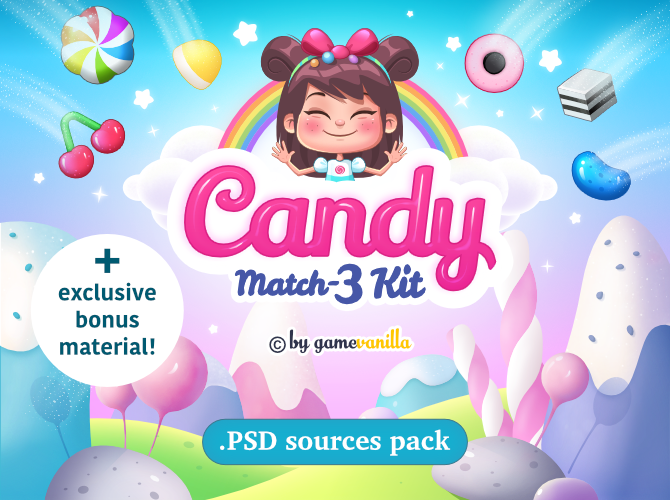 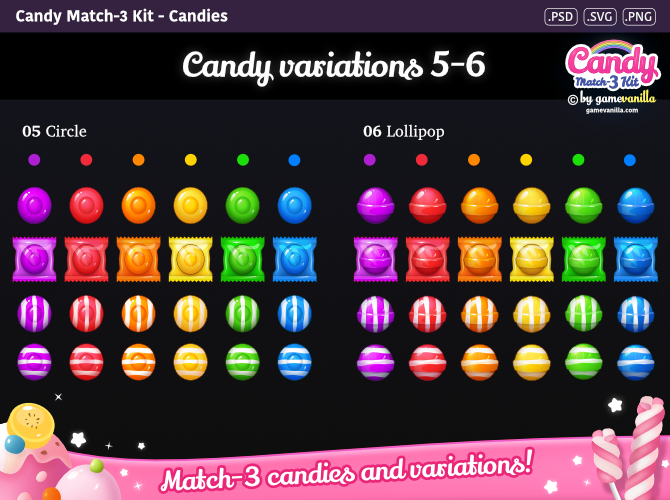 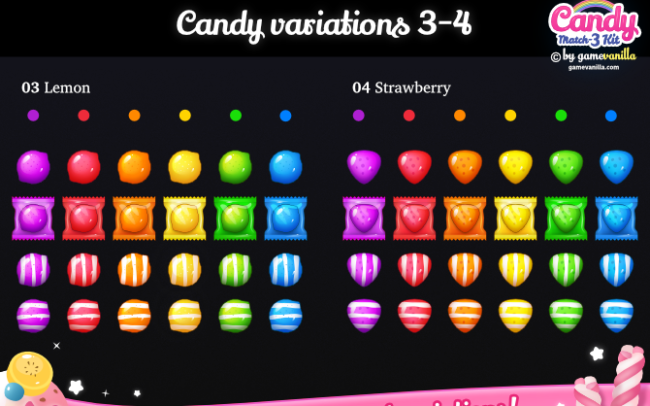 After purchasing Candy Match 3 Kit .PSD Sources Pack, you have the right to use it only for the purposes of developing and publishing a final game. 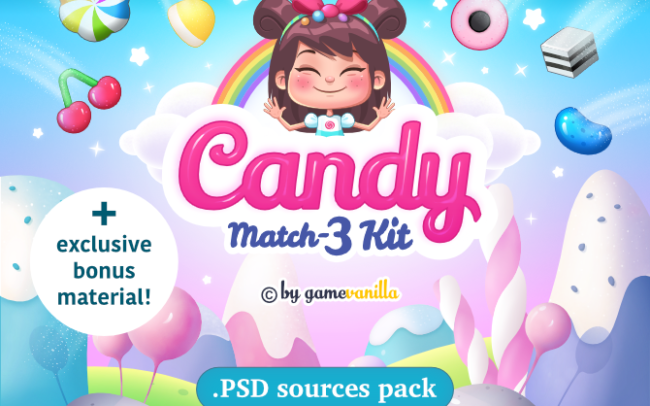 You are NOT allowed to redistribute or resale Candy Match 3 Kit .PSD Sources pack or any of its contents for any purpose (not even after a complete re-skin). 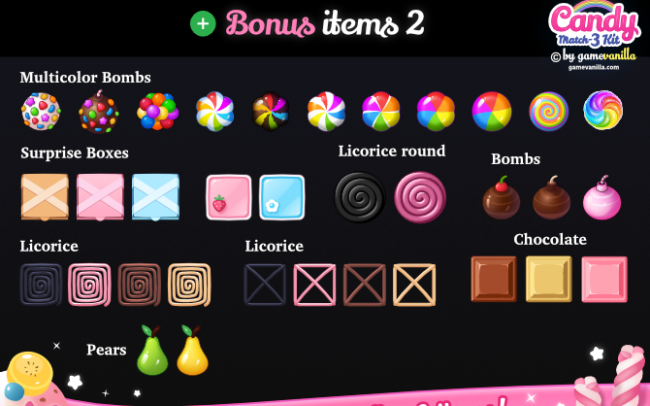 To distribute or resale this product is NOT permitted under any circumstances and is strictly prohibited. 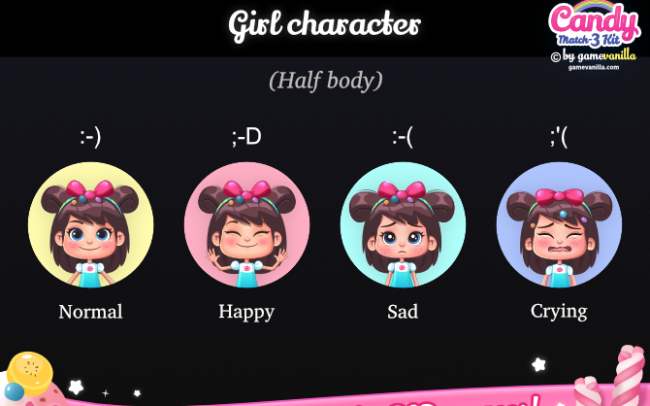 ✔ Develop and publish a game using this pack. ✔ Use this pack without a limitation of period and number of times. 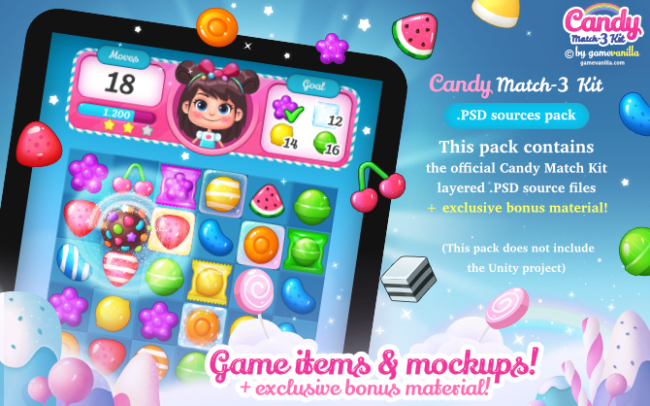 ✔ Use this pack for any commercial purpose related to your game. 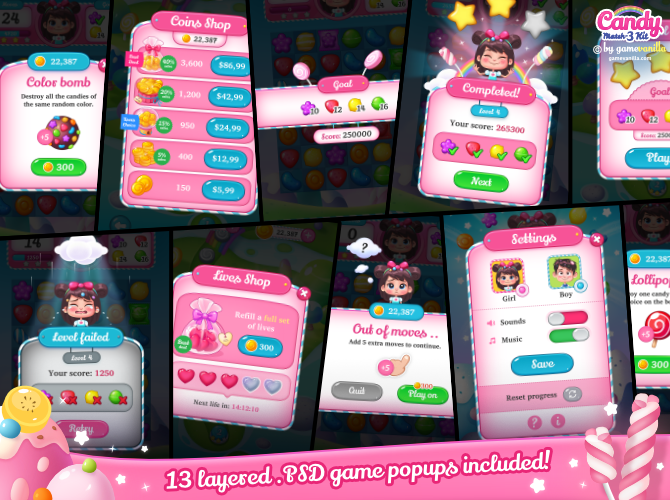 ✖ Duplicate/rename/modify this pack for reselling purposes. 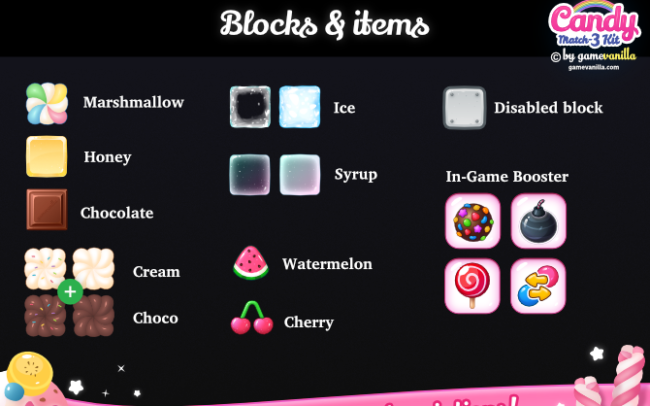 ✖ Use this pack to damage gamevanilla and/or ricimi. 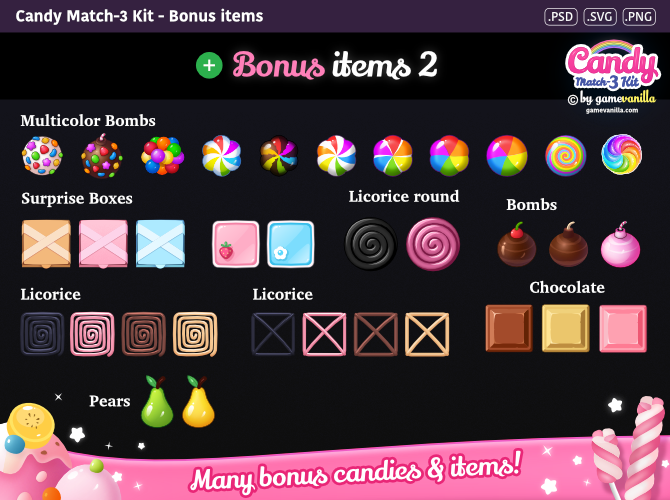 ✖ Use this pack for any unlawful purpose. 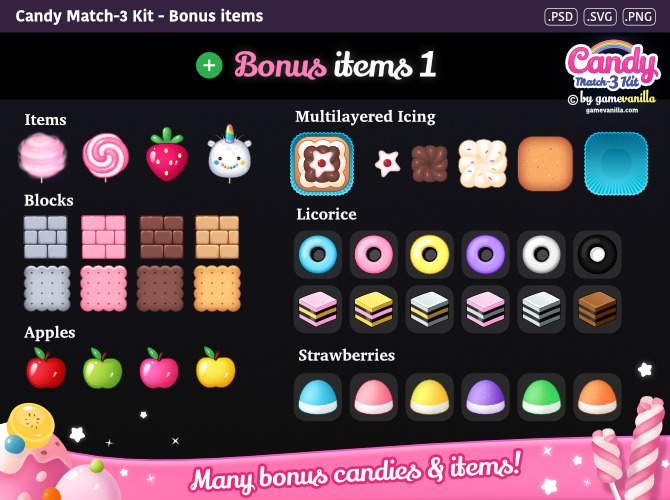 ✖ Distribute, transfer, rent, or license this pack by duplicating and transmitting publicly the materials beyond the scope of permission set out in this license regardless of whether this pack is modified or altered. 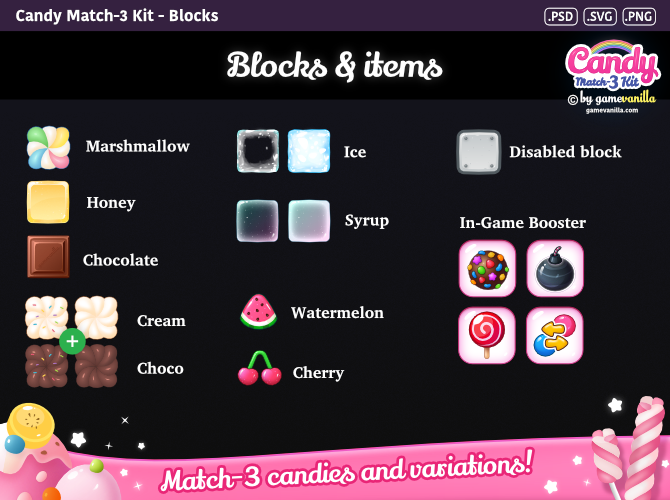 All the items you buy are quality checked by gamevanilla. 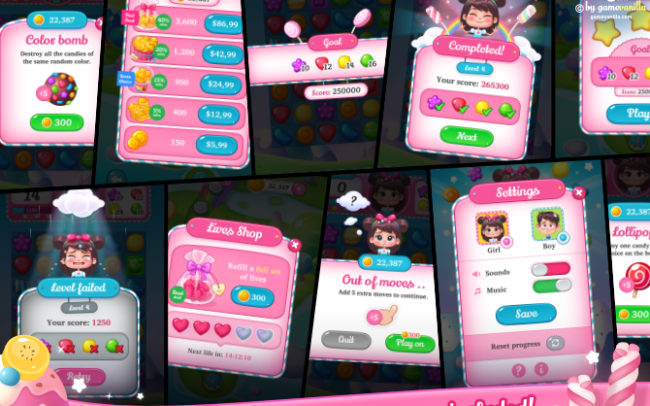 Any future update made available by us is included with every purchase. 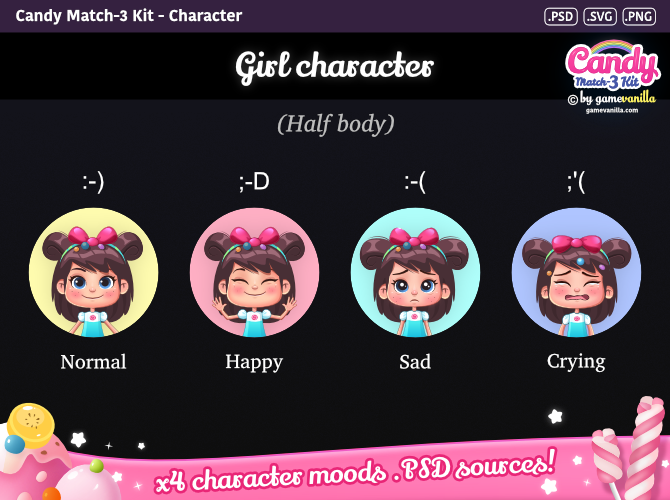 ✔ Availability of the author to answer questions about how to use the pack. 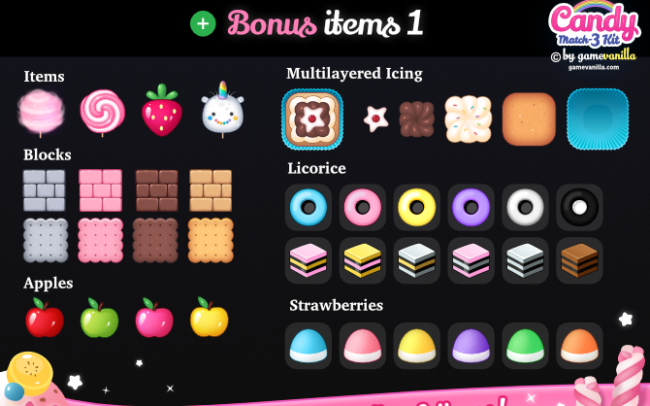 ✖ Help with included 3rd party assets. 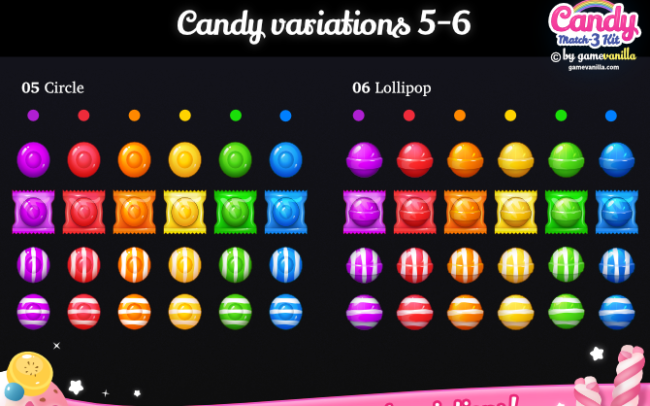 This pack contains the official .PSD source files from our Candy Match 3 Kit asset with exclusive bonus contents.